December 22, 2016, RT interviewed Gordon, who stated he had just returned from visiting Hungary, Slovakia, and Hungary. I'm only finding two pieces of news involving him since then. Trump’s supporters liken the president’s foreign policy to another early president, Andrew Jackson, said J.D. Gordon, a former Pentagon spokesman and Trump campaign adviser on national security. Of course, selecting a commencement speaker is not an easy task. Some colleges consider student input and diversity when choosing a speaker. They develop screening processes to ensure that the speakers are both engaging and appropriate for the audience of graduating students and their families, faculty and administrators. Commencement speakers are supposed to deliver a message of perseverance and success in order to inspire graduates; the speech should be balanced, thoughtful and at the same time provocative. Réka Szemerkényi had no previous diplomatic experience before being named ambassador. She worked as a consultant at the Hungarian oil and gas company, MOL Group. Hungary receives virtually all its energy from Putin’s Russia. Ms. Szemerkényi was involved with negotiations with the Russians but also travelled to Kurdistan (Iraq) to negotiate joint ventures. She worked for CEO Zsolt Hernádi who has appeared on the list of Interpol most wanted for bribery. 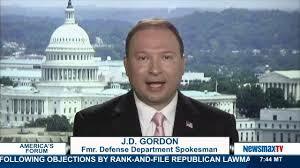 Ms. Szemerkényi’s close associate in Washington is Jeffrey “J.D.” Gordon. He is a communications and foreign policy advisor who served as Pentagon spokesman and was also an advisor to conservative Republican politicians. Last year he joined the Trump campaign as the Director of National Security under Sen. Jeff Sessions, currently the Attorney General. At the Republican National Convention Gordon removed text from the GOP Platform that called for lethal assistance to Ukraine in its struggle against Russia. Gordon admitted that he had contacts with Russia’s ambassador to Washington and he emphasized “the importance of improving relations with Russia.” Gordon visited Hungary on six several occasions. Recently the Justice Department appointed Robert Muller former FBI director, as special counsel to oversee the investigation into ties between President Trump’s campaign and Russian officials. J.D. Gordon’s name appeared in the US media in relation to Russian contacts and it is suspected that the Orbán-regime played a role in establishing the “bridge” between Russian President Putin and the Trump campaign. What's his status at this point? Is he playing into the #TrumpRussia investigations in any significant way?